Domestic economic news caused a dramatic jump in bond yields that reached multi-year highs. The yield on the benchmark 10-year Treasury note shot from 3.06% at the end of trading the previous week to 3.25% in intraday trading this past Friday. This is the highest level for the 10-year Treasury note since the summer of 2011, and it had a negative impact on mortgage rates. The largest move occurred Wednesday following an interview with Federal Reserve Chairman Jerome Powell when he described the economy as “firing on all cylinders.” Wednesday’s economic data confirmed Powell’s comments as the Institute for Supply Management’s Non-manufacturing (Services) Index sharply increased in September to a record high of 61.1%, its highest level since the Institute began collecting data a decade ago. Further, the ADP monthly employment report on private sector payroll growth also came in significantly higher than expected. Bond yields continued to rise on Thursday, and especially on Friday, after the release of the Employment Situation (Jobs) report for September. Also, fresh concerns over Italian and Greek debt triggered a rise in global bond yields with yields on 10-year German, Spanish, and Portuguese government debt rising to multi-month highs, and in the case of Great Britain, multi-year highs. 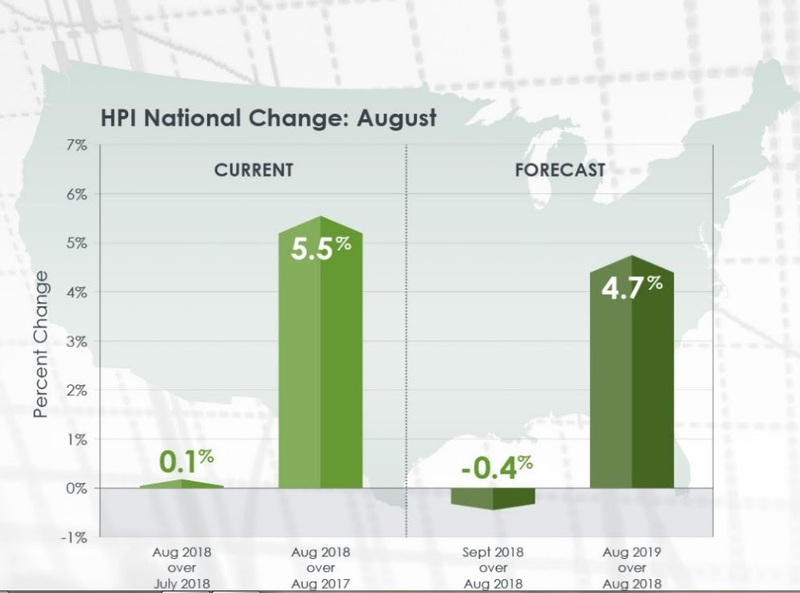 Tuesday, CoreLogic® released its CoreLogic Home Price Index (HPI™) and HPI Forecast™ for August 2018 showing home prices increased in both month-over-month and year-over-year time frames. On a month-over-month basis, prices increased by 0.1% in August 2018. Year-over-year from August 2017, home prices increased nationally by 5.5%. 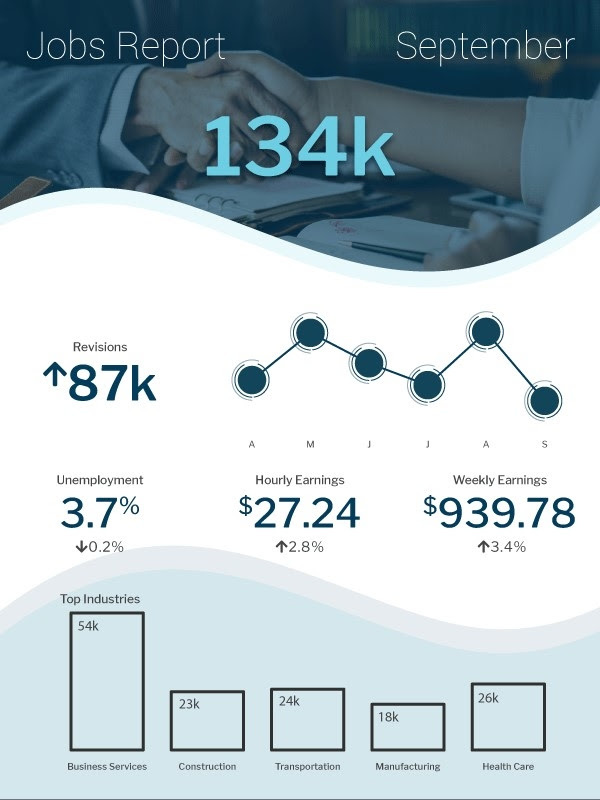 Friday, the Employment Situation Summary (jobs report) for September came up short of the consensus forecast of 184,000 at just 134,000. However, the August reading was revised higher by 69,000 to 270,000. The Unemployment Rate dropped to 3.7%, its lowest level since 1969, even though the labor force participation rate remained unchanged at 62.7%. Average Hourly Earnings growth was reported at 0.3% in September, but the August growth rate was revised down to 0.3% from 0.4%. Overall, this latest jobs report shows the labor market remains strong. Employers are having a difficult time finding qualified workers, and this will pressure wages higher and fuel wage-based inflation going forward. Inflation leading to additional Fed rate hikes, higher bond yields, and higher mortgage rates. Elsewhere, the latest data from the Mortgage Bankers Association’s (MBA) weekly mortgage applications survey showed the number of mortgage applications remained unchanged from the prior week. The MBA reported their overall seasonally adjusted Market Composite Index (application volume) was unchanged for the week ended September 28, 2018. The seasonally adjusted Purchase Index increased 0.1% from the week prior while the Refinance Index decreased 0.1%. Overall, the refinance portion of mortgage activity was unchanged at 39.4% of total applications from the prior week. The adjustable-rate mortgage share of activity increased to 7.1% from 6.5% of total applications. According to the MBA, the average contract interest rate for 30-year fixed-rate mortgages with a conforming loan balance decreased to 4.96% from 4.97% with points increasing to 0.49 from 0.47 for 80 percent loan-to-value ratio (LTV) loans. This past week, the national average 30-year mortgage rate rose to 5.02% from 4.78%; the 15-year mortgage rate increased to 4.50% from 4.26%; the 5/1 ARM mortgage rate jumped to 4.35% from 3.95% while the FHA 30-year rate increased to 4.62% from 4.37%. Jumbo 30-year rates climbed to 4.50% from 4.32%. 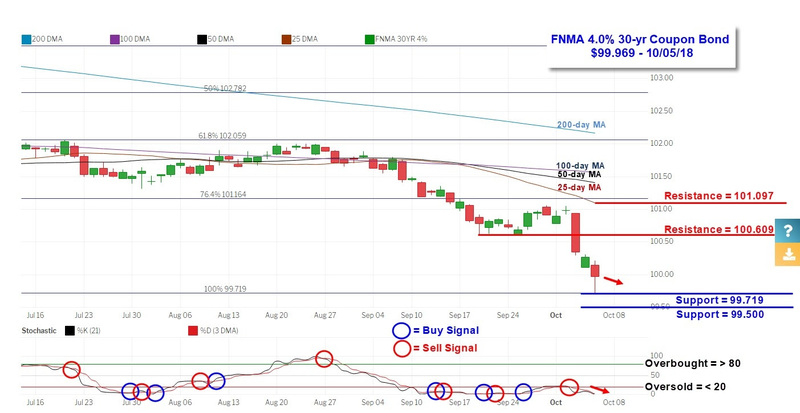 The FNMA 30-year 4.0% coupon bond ($99.969, -93.7 bp) traded within a far wider 132.8 basis point range between a weekly intraday high of 101.047 on Tuesday and a weekly intraday low of $99.719 on Friday before closing the week at $99.969 on Friday. After a slight rebound higher on Tuesday, mortgage bond prices plunged the remainder of the week on renewed inflation fears. The bond fell through support levels to reach the 100% Fibonacci Retracement level at $99.719. The bond is once again extremely “oversold,” but if the $99.719 support level fails to hold the next support level at $99.50 will come into play. A continuation lower to the next support level should result in slightly higher mortgage rates.